Earlier today(July 31), Facebook deleted numerous Facebook pages, including one event aimed at promoting a protest against Jason Kessler's Unite The Right 2, the sequel no one asked for. The Shut It Down DC Coaliton has been meeting for weeks. 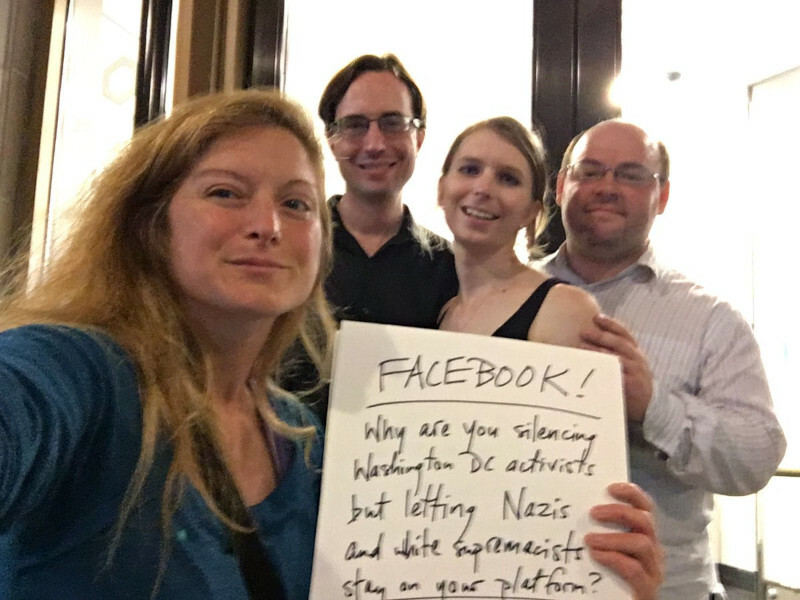 We took over the Facebook event created by outside groups, in a desire to keep it accountable to local organizers. At numerous points, national groups have organized events in DC, and often demanded the resources of local organizers. We took over the Facebook event in question to prevent over-burden, and to control it. One of the big anti-Trump marches of 2017 was the Science March. 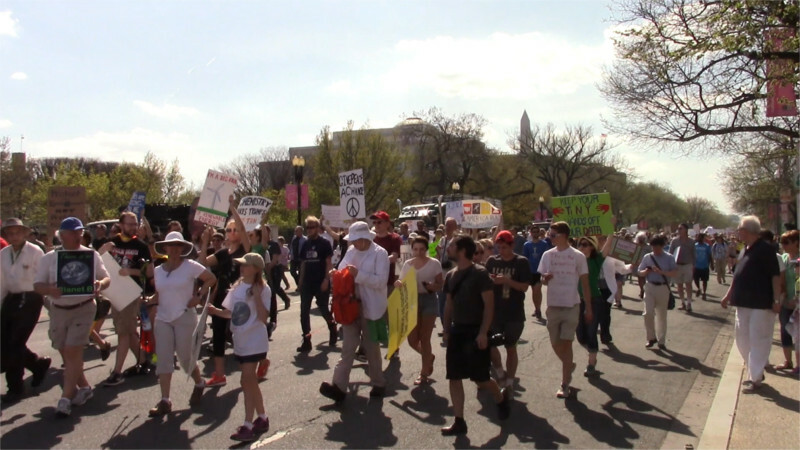 On April 14, 2018 the Science March returned to DC. Although not technically and anti-Trump march, most of the marchers and many chants were militantly anti-Trump. Chants of "fire Scott Pruitt" and demands to save the EPA were heard over and over as marchers worked their way towards the US Capitol. A number of signs also protrayed dinosaurs as a warning about extinction, and climate change came up a lot. In the aftermath of the Cambridge Analytica scandal, TV news stations reported on March 26 that by default the Facebook app on Android sends text messages and phone call metadata to Facebook servers. The technology involved was called "scraping" by one computer expert, raising concerns that Facebook may be able to read even encrypted text messages right off the screen. Update 3-27-2018: Latest report is Facebook is stealing metadata but not content, but that alone means Facebook knows who and when you call and text if you have their app with default settings. On the 14th of December, the FCC voted 3-2 to scrap all net neutrality protections. 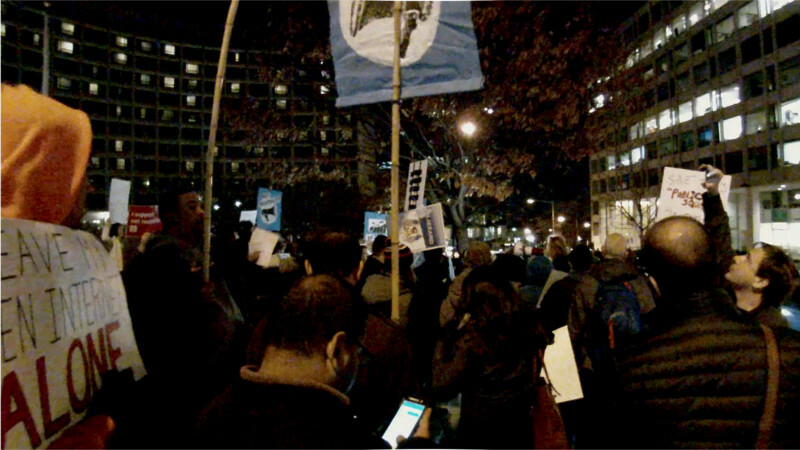 Both of the dissenting FCC commissioners spoke at a mass rally in front of the FCC prior to the vote. Lawsuits are now being filed to halt the revocation of net neutrality. If the lawsuits fail, you may need to buy a video upgrade to your Internet service or use Torbrowser to bypass your carrier's restrictions to watch video on this site. On the 7th of December, FCC Chairman Agit Pai was the guest of dishonor at a swanky dinner held at the Hilton on Connecticut Ave. Protesters outside shouted disapproval. Pai is a former Verizon lobbyist now seeking to dismantle all vestiges of Internet neutrality now that he's at the FCC. In addition to this protest there were protests at Verizon stores all over the US. FCC Chairman Agit Pai has announced plans to revoke net neutrality protections as early as December this year. Once this takes place, ISP's will be able to block popular websites unless people pay for "social upgrades," "media upgrades," "entertainment upgrades," etc. With Cable TV subscriptions plummeting, Big Cable and Big Telcos are keen to apply that business model to the Internet. As usual, Tor will defeat their blocking. I'm guessing the big-dogs probably have a way to make private phone calls; so I'm wondering what kind of person I should ask about the successful methods. I mean, I could ask a PI, get to know a phone company technician and offer an honorarium for good info, etc. I'll bet some people still have privacy. How can I approach such people and ask the right questions? Read more about Phone Privacy? On Thursday, the 1st of June, Comcast blocked access to Archive.org, affecting videos on this site for several hours. When any ISP does this, Torbrowser can still access the blocked site as no ISP can see what you are accessing. YOU NEED TOR if you want reliable access to content in this post-net neutrality age. On the 18th of May, the FCC met to vote on keeping existing net neutrality rules or scrapping them and starting a new rulemaking from scratch. 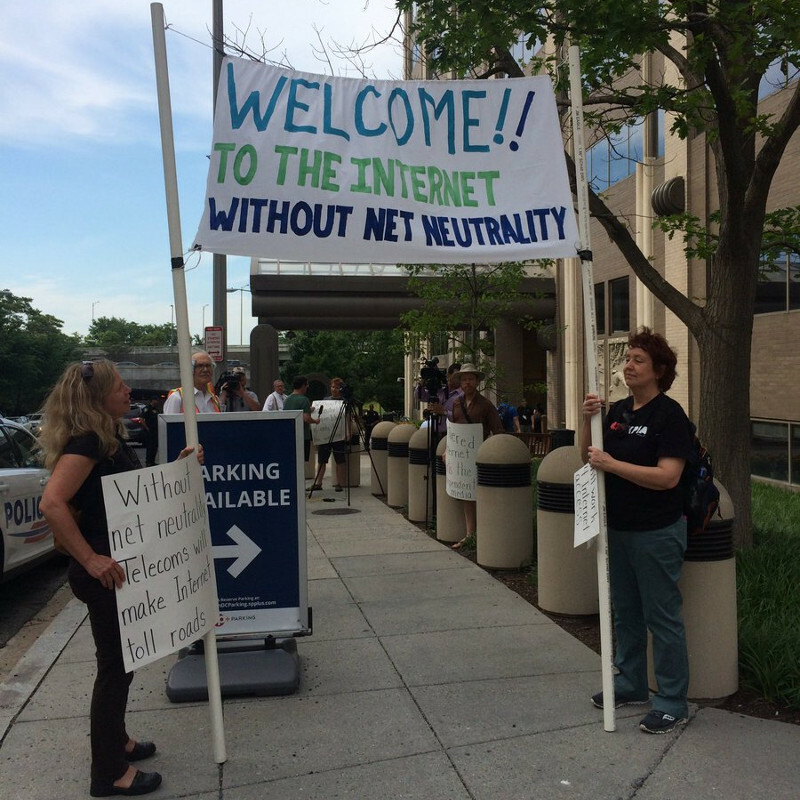 Net neutrality protestrs set up outside to oppose the push for "fast lanes" and "toll roads" on the Internet. The FCC voted 2-1 to scrap net neutrality anway, so the fight is ON. 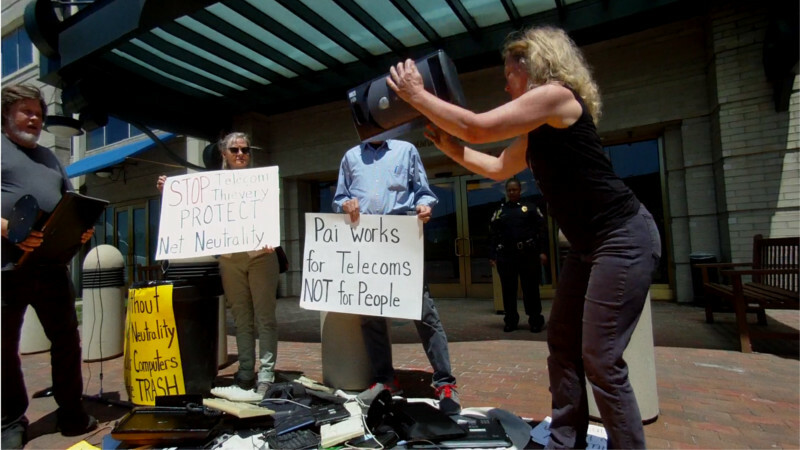 On the 16th of May, net neutrality activists smashed computer hardware in front of the FCC, then loaded the junk into a trash can and attempted to deliver it to FCC Chairman Ajit Pai. 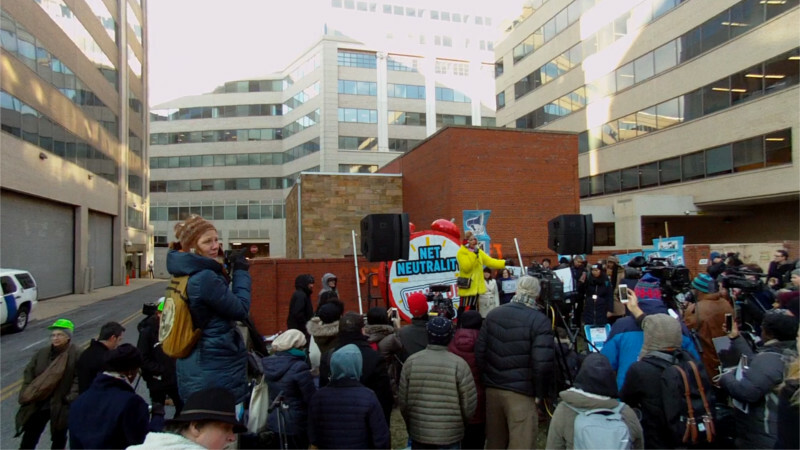 The smashfest carried a serious message: that a non-neutral, corporate-content centric Internet would make most people's computers and phones as worthless as the smashed junk in front of FCC headquarters.